In the latest edition of our weekly podcast, we chat with Mario Tabone, owner of Tabone Vineyards, about his new tasting room on Old Mission Peninsula; check in with Jessica Youngblood of Youngblood Vineyard about the Harbor Hill Mobile Bottling Line; discuss upcoming events and more. You can listen in by clicking here. The podcasts are available via the link above, the "MBTB Radio" button at right, on Podbean.com, or on iTunes. You also can subscribe on iTunes so they download directly to your smartphone when they go live! Check out our previous episodes here and feel free to drop us a line and let us know what Michigan wine topics you'd like to hear about on the show. If you've enjoyed these podcasts, please leave us a review on iTunes! In the latest edition of our weekly podcast, we chat with Mike Laing about changes and rebranding at Mawby, and discuss what we're drinking, upcoming events and more. You can listen in by clicking here. In the latest edition of our weekly podcast, we recap our recent bus trip with 40+ guests to the Traverse Wine Coast, and discuss upcoming events and more. You can listen in by clicking here. In the latest edition of our weekly podcast, Shannon reports from the recent Vines to Wines Competition/Conference in Petoskey, where he was a judge, and we discuss what we've been drinking, upcoming events and more. You can listen in by clicking here. In the latest edition of our weekly podcast, we chat with Adam McBride of Hickory Creek Winery about what motivated him to own a winery and about the popular WSET (Wine & Spirit Education Trust) courses he's been hosting there, as well as discuss what we've been drinking, upcoming events and more. You can listen in by clicking here. In the latest edition of our weekly podcast, we chat about the history and future of the Michigan Wine Competition with Chief Judge Chris Cook, and discuss upcoming events and more. You can listen in by clicking here. In the latest edition of our weekly podcast, we debate which varietal should be considered Michigan's red "identity grape" and discuss what we've been drinking, upcoming events and more. You can listen in by clicking here. In the latest edition of our weekly podcast, we chat with Emily Dockery of the Michigan Wine Collaborative about the new version of the Vintage Michigan program, and discuss what we've been drinking, upcoming events and more. You can listen in by clicking here. In the latest edition of our weekly podcast, we chat with yoga teacher (and Northern Michigan wine expert) Cristin Hosmer about the upcoming Yoga Retreat at Chateau Chantal, and discuss what we've been drinking, upcoming events and more. You can listen in by clicking here. 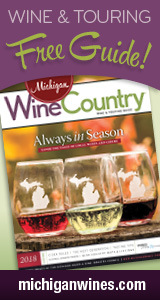 In the latest edition of our weekly podcast, we chat with Jim Rink, editor-in-chief of Michigan Uncorked, about his new digital magazine on Michigan wine, answer a bunch o' Ask MBTB questions, and discuss what we've been drinking, upcoming events and more. You can listen in by clicking here.